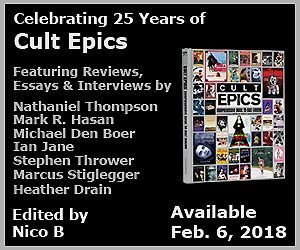 Although this doesn’t fall into the realm of filmmaking per se, it’s the gear which enabled me to access a breadth of programming via cable TV during my youth and young adult years, and ties nicely with the 5th annual Video Store Day, of which an Editor’s Blog tied to the use of these artifacts resides at KQEK.com. For continuity, you might want to read it beforehand, or perhaps not, as these images do provide some context to the stages of my home video, cable and pay TV enlightenment of my youth (even though I’m not that old). As I recount in the lengthy piece, when my parents bought their house in 1972 it came pre-wired for cable TV, and once the Admiral B&W TV set was plugged in, we threaded a coax cable that poked up from under the 70s gold carpet into this device, which sent cable via VHF channels to a pair of rear screws that were normally used for the TV set’s rabbit ears. 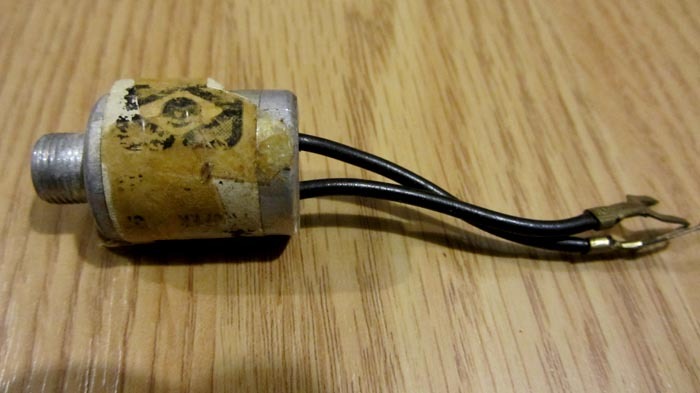 This is the actual adapter provided by the cable company around 1972. You can still see the old Rogers Cable TV logo on the paper label that’s fading and drying up. Rear of a JVC TV editing TV with VHF, UHF, and pro connections. Left side of the rear of a JVC editing monitor features video UHF inputs & looped output from an editing VCR, a TV out, audio (mono) out, and an 8-pin connector that sent audio & video back & forth from an editing VCR, enabling one to see playback and actually record whatever was on the TV. Right side of TV has those VHF and UHF screw terminals onto which that the adapter is fastened. 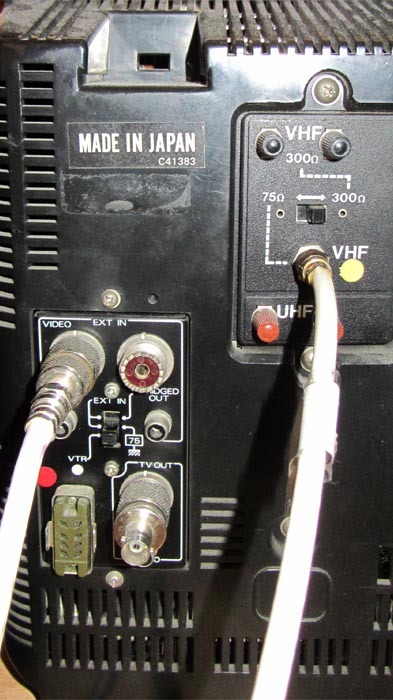 This TV offered a choice between VHF signals via rabbit ears using the two screws, or VHS via coax connection (white cord). These are later variants range from the first to more streamlined versions, and chunky ones that came with purchased VCRs. 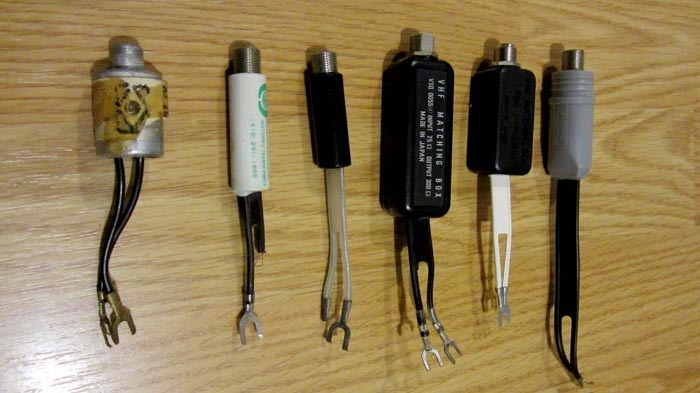 The grey one at the far right was used to feed the coax cable into the rear of a radio amp / receiver to enjoy cleaner (and more) radio stations. To send cable from a single outlet to both TV and radio, you needed one of these – splitters – which, as available from Radio Shack, came in a variety of configuration. One thing to always remember is that any break or split in a signal, as via a splitter, would cause a drop in signal strength, adding noise and dirtying up the images that ultimately made it to your TV screen. 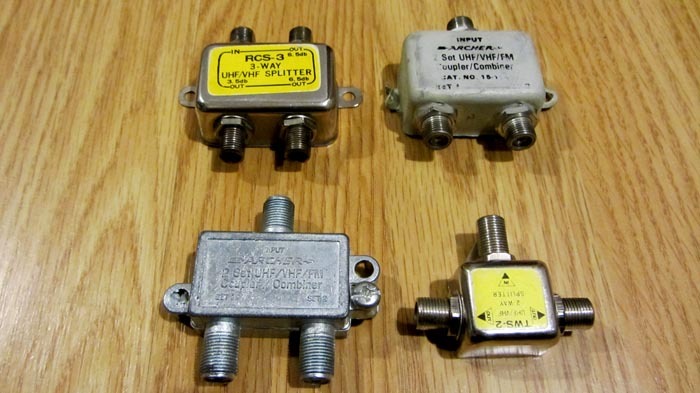 Various 2- and 3-way coax splitters from Radio Shack. To compensate for signal drain, you could also buy an amplifier, which we did. My dad paid about $70 circa 1982 for this Triple Crown Electronics amp that boosted the signal prior to sending into a splitter. Or two (for upstairs). Or three (for a second bedroom or living room). 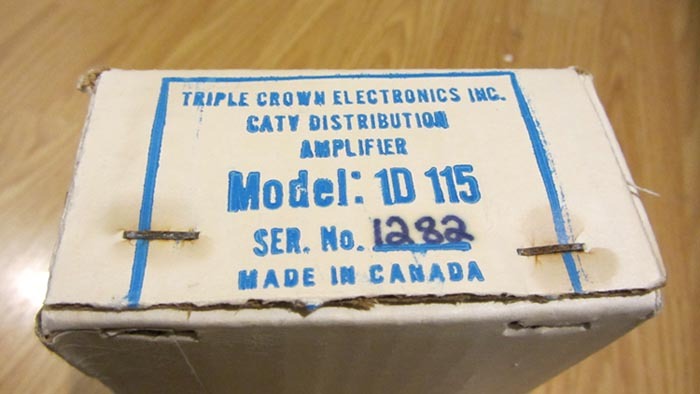 Box for a Triple Crown Electronics Inc. indoor cable TV amplifier, model ID 115, circa 1982. 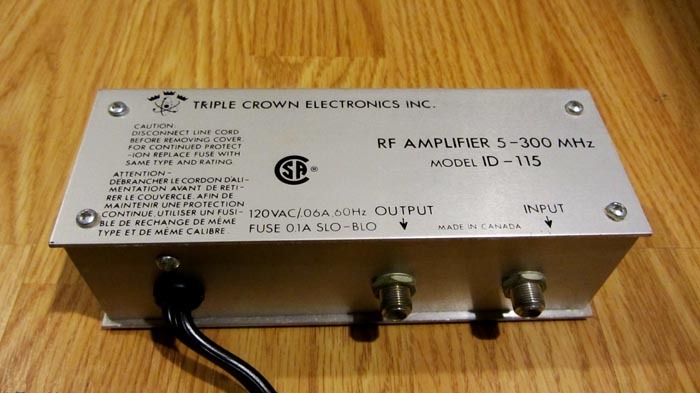 Triple Crown Electronics Inc. indoor cable TV amplifier, model ID 115, circa 1982. 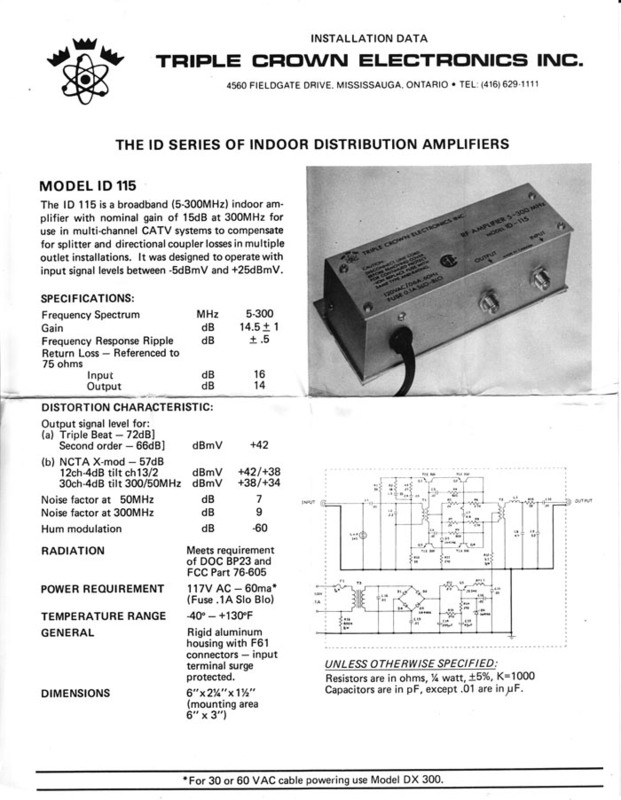 Specs for the Triple Crown Electronics Inc. indoor cable TV amplifier, model ID 115, circa 1982. Years later I bought a better model from Tin Lee Electronics, which came with a knob that allowed one to adjust the signal strength. The plus: you could scale back the boosted signal just before noise started to creep into the picture, finding that sweet spot. 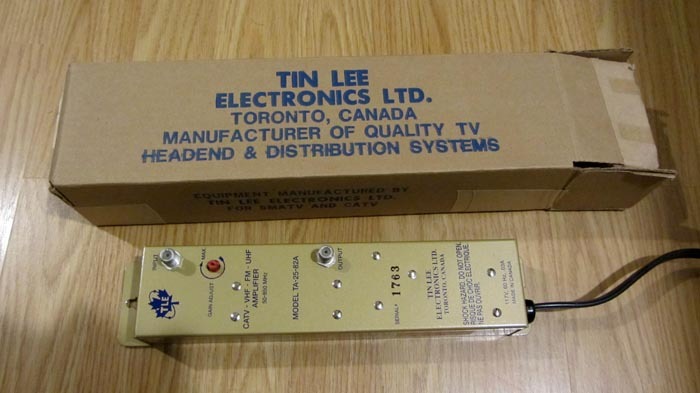 Tin Lee Electronics cable TV amplifier with potentiometer, probably bought around 1994. Tin Lee Electronics dealt with pros and consumers, and I remember buying some coax terminators from them as well. Their prices were reasonable, the staff down to earth, and I think the owner was the cousin of my computer guy, so the company came with a good recommendation even though I’d bought one of their products way back in 1983. 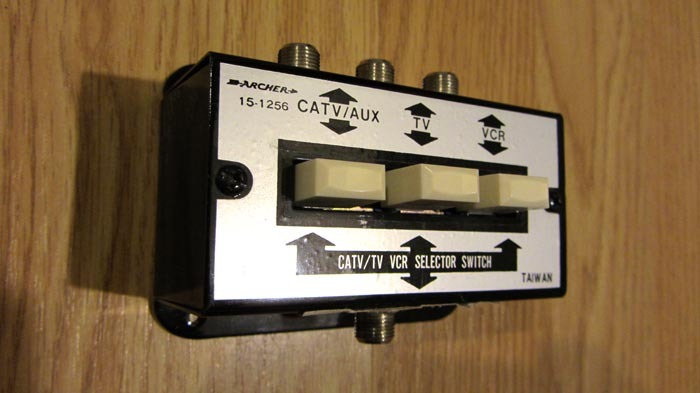 When my dad bought the first family VCR, the Eaton’s salesman, like many older vendors handling new video gear, knew little about connection issues, and he sold us an A / B switcher box for $19.95 thinking that would solve what ended up being a non-problem. Instead of splitting a signal, the idea was to swap between the VCR and the cable TV signal, choosing A or B to watch on TV. Little did the salesman know that the box wasn’t necessary, as all VCRs came with tuners ready for cable, and a front button that allowed one to switch between watching straight cable using the TV’s tuner or rotary dial, or whatever was coming from the VCR. 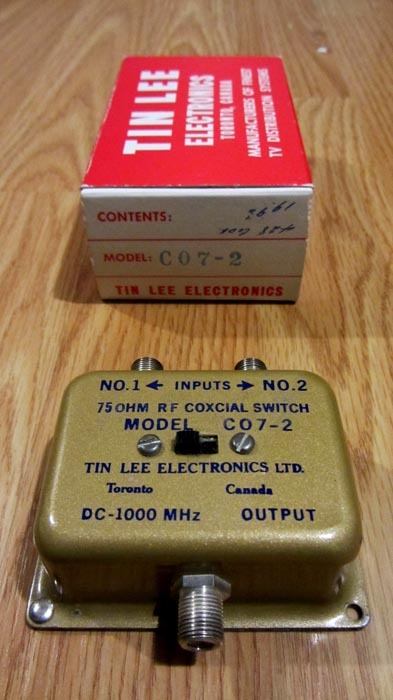 Tin Lee Electronics A / B coax switcher. Radio Shack 3-input coax passive switcher, circa mid-1990s. I wish I had photos of the old TV room – they may well exist in storage – but for now this is the cut-off for archival gear from The Hasonian. Well, most of remains is small and has stayed in a small box of odds & ends for years. Anyone who’s had to rewire the home TV room into a sorta home theatre set-up over the decades knows there might be some use of keeping old connectors, and in fact some are still useful. 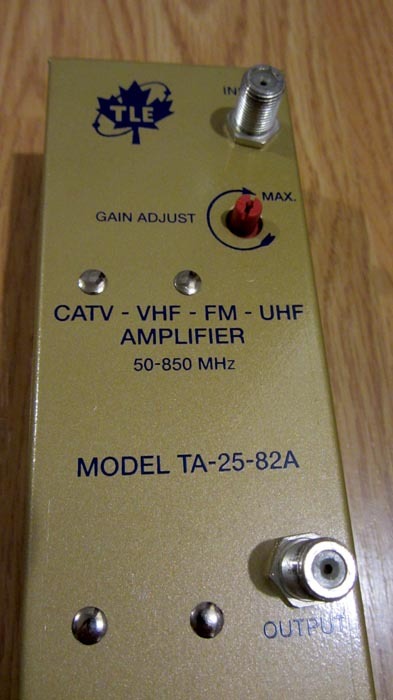 If you have an A / V amplifier that accepts one digital 5.1 input using a coax cable with RCA connections at the ends, but have multiple sources – a DVD player, a Blu-ray player, one or two computers with digital coax outputs – instead of buying a more expensive amp or getting a switcher box, a simple passive switcher will do the job fine. I’ve tossed them into the box and pulled them out for occasional use over the years, so they’re not completely useless. An amp or switcher with multiple HDMI inputs would solve the problem, but this is simpler for the short-term. 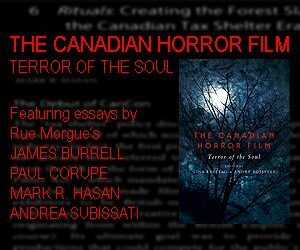 I should have another Editor’s Blog at KQEK.com on Video Store Day, and maybe a few more snapshots of related gear here at Big Head Amusements as we approach VSD this Oct. 17th.